Take your family film nights to a whole new level with the OLED55E8PLA. Equipped with the latest technology, you’ll be amazed at the image and audio quality. Cinema HDR with Dolby Vision: This LG TV recognisees a range of HDR formats such as HDR 10 and Technicolour, so you can always enjoy a fantastic viewing quality. α9 Processor: LG’s exclusive processor produces crystal clear and precision-sharp detailing with every scene. Front Firing Dolby Atmos speaker: Experience LG’s latest audio visual innovation. This specially designed speaker directs the sound straight to the viewer, so you can enjoy an even more powerful level of audio. The OLED55E8PLA comes equipped with the latest Smart TV features to give you access to unlimited online content. Catch up on TV with on-demand services including ITV Player and BBC iPlayer. Plus, with LG’s innovative ThinQ AI technology, your TV will listen, think and answer your questions to help make life easier. Link up a range of devices with the variety of connection ports on the OLED55E8PLA. You’ll find four HDMI and three USB ports – great for DVD players and game consoles. 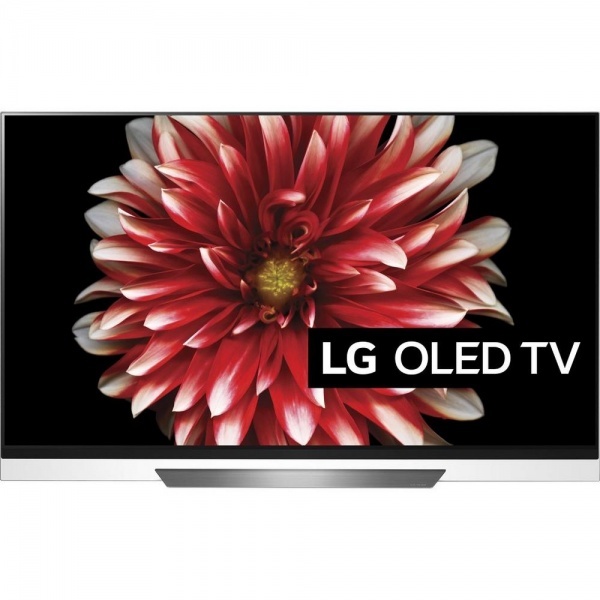 Or, use the Bluetooth connection to link your phone or tablet to this LG TV wirelessly. Share your recent holiday and family photos on the amazing OLED screen. You can also wow your friends with the Floating Picture on Glass design. LG has made the TV so thin and light that the screen can bond to a transparent pane of glass. The effect is truly stunning.